This book was designed to empower any and all Toastmasters around the world to follow their passion and live their dreams NOW! Dr. Carlton Young is an international motivational and inspirational speaker, master storyteller, and bestselling author. Dr. Young is the first-place winner of the 2015 District 44 International Speech Contest in Atlanta, Georgia. Dr. Young went on to compete in the semifinals of the International Convention Speech Contest at Caesars Palace in Las Vegas, Nevada, on August 13, 2015. Dr. Young decides to put together this small book after not placing in the semifinals. 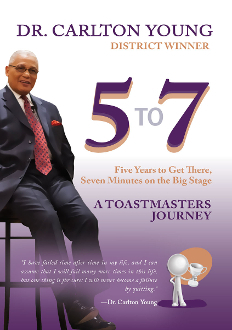 When interviewed, Dr. young stated that he wanted to share his experience with Toastmaster around the world.